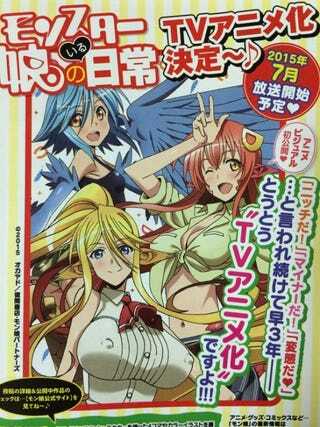 On Wednesday rumors began swirling around that OKAYADO's super popular monster girl-theme harem manga (and my personal favorite currently running manga series) Monster Musume no Iru Nichijou, aka Monster Musume: Everyday Life With Monster Girls, would finally be getting the anime adaptation fans have been clamoring for ever since the series started back in 2012. Well now scans of the announcement for the anime are now circulating, and it is matching up with the earlier rumors of a Summer 2015 airing. Needless to say I'm rather ecstatic and have my hype show for Summer.